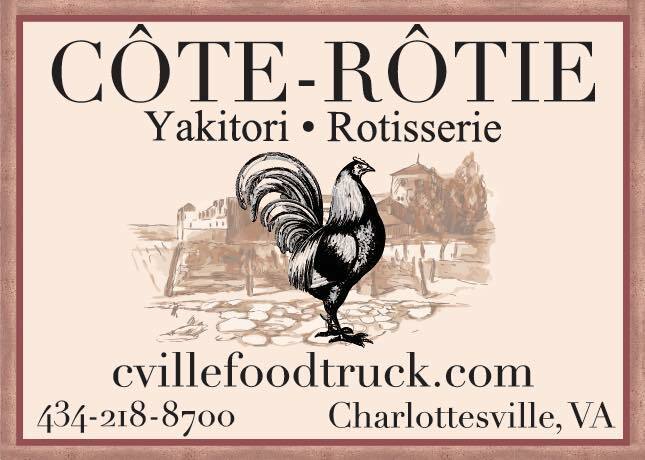 A promising food truck by two Culinary Institute of America alum has just hit the Charlottesville streets. Côte-Rôtie is the product of Peter and Merrill Robertson, a husband-and-wife team who recently arrived from the Hamptons. Both bring impressive culinary resumes. Peter has worked under one of the nation’s most acclaimed chefs, Frank Stitt, of Highlands Bar and Grill, in Peter’s native Birmingham, Alabama, while Merrill once managed a gourmet shop in the Hamptons, Loaves & Fishes. And, together in the Hamptons for nearly eight years, they ran a catering business and a tiny, ambitious set-menu restaurant with just twelve seats, called Dish. What brings them to Charlottesville? Like most of us, they are here by choice. Merrill’s brother and sister both live here, and Peter and Merrill “had always enjoyed coming to visit,” said Merrill. So, when they lost their lease on Dish, they headed south. The Hamptons’ loss is our gain. But, why a food truck and not another restaurant? “We wanted something small and outfitted exactly how we wanted it with the right equipment and placement,” said Merrill. “A food truck fit that bill.” Their restaurant Dish was so small that they never needed to hire staff, and came to enjoy operating everything themselves. Côte-Rôtie’s cuisine likewise draws on the preferences of Peter and Merrill. They love Japanese food, for example, and would frequent yakitori spots in New York. So,they had a yakitori grill custom-made in Japan just for the truck. “It gets extremely hot and is just a great all-around grill for everything,” said Merrill. The two also have fond memories of “fabulous rotisserie chicken” at markets in the south of France, so they had a rotisserie built for the truck as well. Utilizing the rotisserie, the truck will offer full take-home meals of rotisserie ducks and chickens, with potatoes, a salad, and a vegetable. If what I’ve sampled from the truck is any indication, I love to eat what they love to eat. At just $9, the steak frites was worthy of a great bistro, rivaling any version in recent memory. “Perfectly ” is a lazy, over-used adverb in food writing, often empty of meaning. But, here it is spot-on. 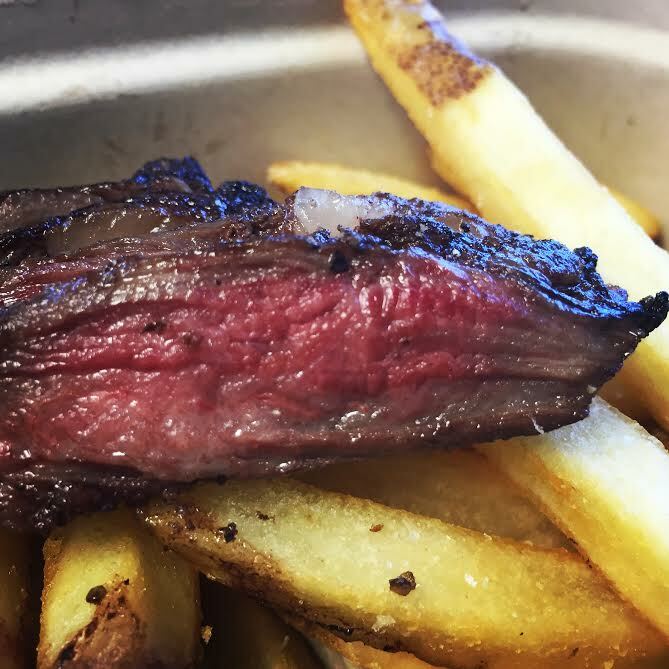 Steak frites is not rocket science, but both the steak and fries were indeed perfectly cooked. A hard sear on the skirt steak created an umami-laden crust, encasing medium-rare meat that, thanks to being sliced properly, was “melt-in-the-mouth good,” as one reader put it. The fries were also perfect, with all the indicia of being fried twice, as is ideal: a crisp, salty exterior and a creamy, buttery interior. It’s a bold move to arrive in Charlottesville and start hawking fried chicken. 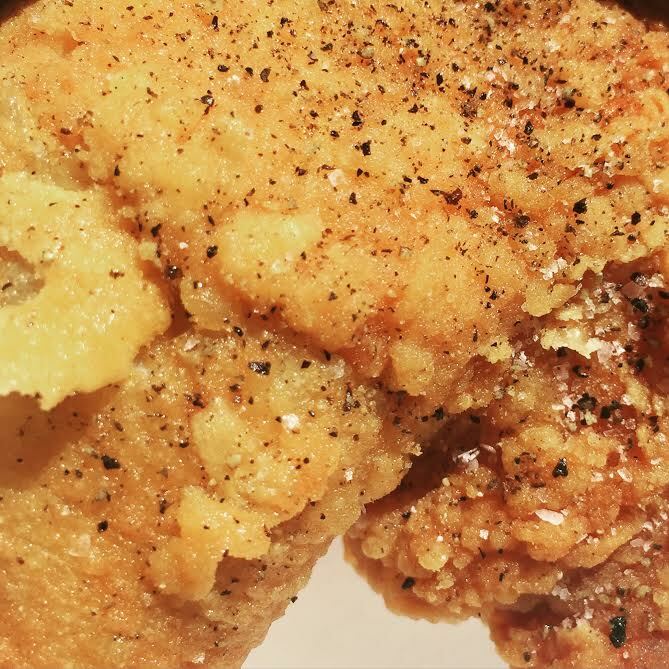 With so many great fried chicken venues in the area, it’s a bit like showing up in Paris and selling baguettes. But, Merrill insisted, “Peter makes awesome fried chicken.” So, I had to try. And, she’s right. Awesome. It’s an instant contender for best in town. I don’t think I’d heard a crunch that loud since Florence Henderson was pitching Wesson in the early eighties. In addition to catering, Côte-Rôtie plans regular stops around town. This week, on Tuesday and Thursday from 11:30 until 2, they will be downtown at the parking lot 100 E. Water St. And, Friday, they will be at the Wine Warehouse. They also plan to visit vineyards, breweries, and events around town. This Saturday, they will be at Henley’s Orchard, and on October 24, they will make their debut at Charlottesville’s top food truck destination, Champion Brewing Company. Follow along on Facebook for locations, dates, and times.